Industry Cosmetics introduces My Skin & Co., which is formulated for use by actors and models in preparation for film and photo shoots. Their proprietary formula has been created by leading industry professionals with decades of experience in all phases of Barbering, Cosmetology, and Aesthetics, and is the industry’s #1 Choice for smooth camera ready skin. It contains certified organic tea tree oil that is infused with five bacterial fighting anti-inflammatory ingredients that are perfectly pH balanced ingredients, allowing nature and science to work in harmony not only above, but below the skin. Today I will be reviewing their Exfoliating Scrub for use on ingrown hairs, razor bumps and inflammation and their Roll On also for use on ingrown hairs, razor bumps and inflammation. This Exfoliating Scrub has been designed to invigorate skin by cleansing pores deep down and gently exfoliating surface skin. It is infused with Certified Organic Tea Tree Oil and White and Black Willow Bark Extract. It is for use by both men and women. It can be used on the face, bikini area, legs, underarms and basically anywhere that ingrown hairs pop up or razor burn is an issue or where there is inflammation. It has a fresh invigorating scent that is unisex and comes in a unisex tube that is a regular brown. Don't be fooled though, this is a powerful scrub that gets rid of ingrown hair, razor bumps and inflammation like nobody's business. I think it is one of the better products I have used for ingrown hairs. 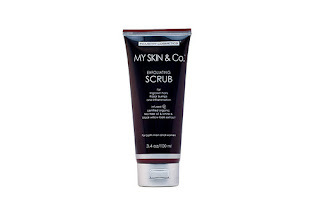 This is a great scrub and I would highly recommend it for anyone, man or woman. I like that it has many anti-inflammatory ingredients too. Their signature liquid treatment also comes in a Roll-On Bottle. Just apply to affected area twice daily until clear. 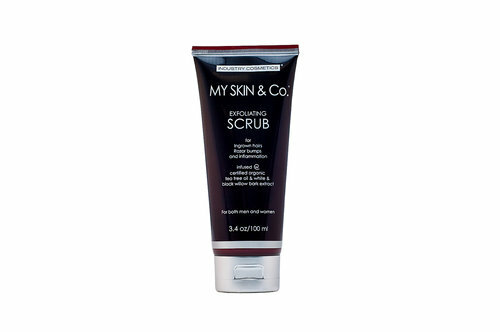 My Skin & Co. has a liquid treatment that is used to be applied to ingrown hairs, razor bumps and inflammation. This is the same liquid treatment, just in roll on form. It is made with Organic Tea Tree Oil and White and Black Willow Bark for the eradication of ingrown hairs and razor bumps. The treatment is for those who don't want to use an exfoliating scrub to rid themselves of the above. It can be used on men's faces, women's bikini area, legs, underarms, anywhere that ingrown hairs or razor bumps pop up. This is nice because it is a little less messy than a scrub or you can use it in conjunction with the scrub to be more aggressive about getting rid of the ingrown hairs, razor bumps and inflammation. I prefer the Roll On or Liquid Treatment to the Exfoliating Scrub. My Skin & Co. is available online at www.gomyskin.com. Like My Skin & Co. on Facebook: https://www.facebook.com/gomyskin; Follow My Skin & Co. on Twitter:@gomyskin and Follow My Skin & Co. on Instagram:https://www.instagram.com/gomyskin/.